She was a high school freshman then, a teenager struggling with being taunted and bullied. People made fun of Ashley Barnett because of her small stature, the result of her being born with the most common cause of dwarfism. “I had a difficult time reconciling why God would make me like this if he knew it would be so painful,” Barnett recalls. So when a high school senior at her parish invited her to join a faith-related youth group, Barnett was hesitant before she cautiously accepted. Now 28, Barnett strives to help create a deep relationship with God for young people—in her role as youth minister of St. Charles Borromeo Parish in Bloomington. 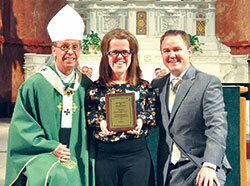 Her efforts led her to be recently honored with the archdiocese’s 2017 Youth Ministry Servant of the Year Award. Barnett received the honor during a Mass on Sept. 5 in SS. Peter and Paul Cathedral in Indianapolis. 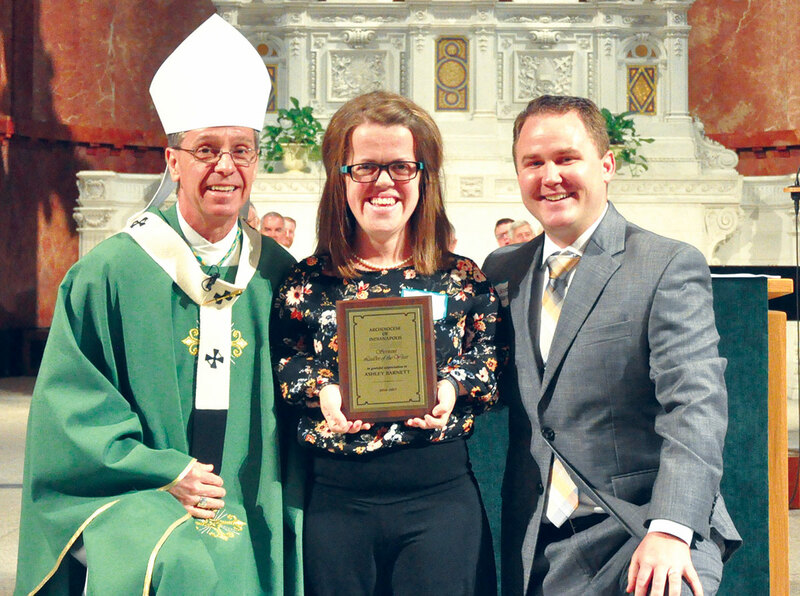 Anita Navarra of St. Mary Parish in Greensburg and Leah Massingale of St. Michael Parish in Greenfield were also honored during the Mass, which celebrated leaders who serve in Catholic school, catechetical and pastoral ministries across the archdiocese. Sometimes that shared faith journey includes taking a group of highschool youths to the March for Life in Washington or the National Catholic Youth Conference. On Friday mornings, it also means she cooks breakfast and leads a Gospel discussion for about 40-50 middle-school students before they head to classes at the parish school. Always, she wants to lead them to a closer relationship with Christ. Twenty-eight years have passed, but Anita Navarra still remembers the phone call that changed her life. Now, Navarra is the director of religious education at St. Mary, the parish where she has received the sacraments of baptism, reconciliation, holy Communion, confirmation and marriage. She is also the recipient of the archdiocese’s 2017 Excellence in Catechesis Award. Thoughts of Jesus are always close to Navarra’s heart and efforts. “My Catholic education has helped me want to serve others and stay connected to Jesus in my life,” she says. “We can provide all the educational programs, but the main focus is on Jesus—and how we can live out that Gospel message. As the recipient of the archdiocese’s 2017 Saint Theodora Excellence in Education Award, Leah Massingale has two main goals in teaching science to her middle-school students at St. Michael School in Greenfield. One is to introduce them to the beauty and wonder of the world that God has created. The other is to reinforce for her students that God sees beauty and wonder in them. Massingale longs to show her students the difference they can make in the world. Most of all, she hopes the example of her life will draw them closer to Christ. That approach was the focus of a homily shared by Archbishop Charles C. Thompson during the “Mass for Co-Workers in the Vineyard”—the title of the Sept. 5 liturgy that celebrated pastors, principals, school presidents, youth ministers, religious education directors and other leaders across the archdiocese. The archbishop encouraged the leaders to focus on the power of mercy to change hearts and lives. On a day of celebration, the archbishop ended his homily by celebrating the connection he has with the leaders, and the great opportunity he shares with them.